Geelong has been heavily involved in recent trade periods. THE FULL price of recruiting Patrick Dangerfield, Lachie Henderson, Gary Ablett and Zach Tuohy will be realised as soon as this year, with Geelong preparing to be hamstrung in future trading scenarios. Clubs have been aware of the rolling four-year restriction since 2015 which will be enacted for the first time next season. As a result, Geelong will need to stump up a second first-round selection in this year's draft or face the prospect of entering 2019 with its hands tied on its opening pick. After netting Dangerfield (2015 pick), Henderson (2016 pick), Ablett and Tuohy (2017 picks) through trades, any future offers for non-free agents will need to involve current Cats or picks outside the first round. 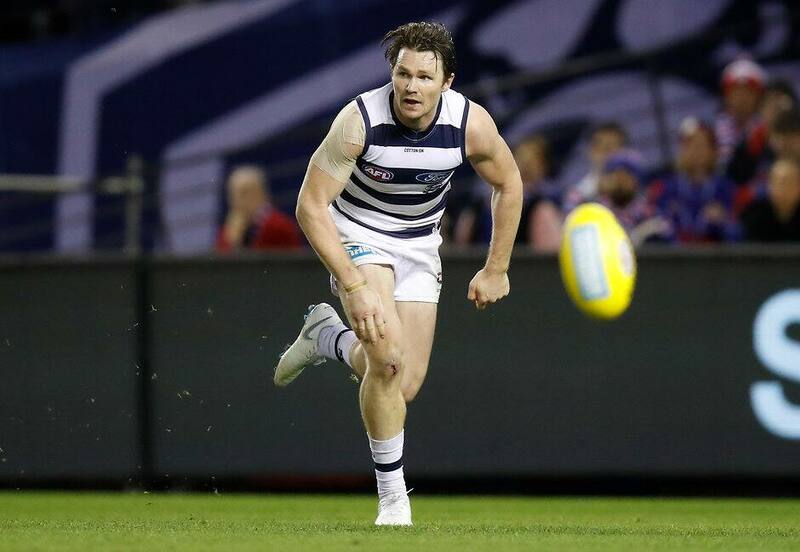 Out-of-contract Cats include Rhys Stanley and Jackson Thurlow, plus unrestricted free agents George Horlin-Smith and Daniel Menzel – with the latter's talks expected to ramp up in coming weeks. As it sits, Geelong holds picks 11, 47, 54, 55 and 65 for 2018, having moved out its second-round pick for Gary Ablett before late pick swaps with Richmond and Carlton (Darcy Lang trade). Outside of Collingwood, the rest of the competition has already met its quota and is free to place 2018 and 2019 first-round picks on the table. The Pies selected boom youngster Jaidyn Stephenson at No.6 in the 2017 NAB AFL Draft and will need to trigger one first-round selection in 2018 or 2019 after not taking any between 2015-16. Should it win the race for Gold Coast restricted free agent Tom Lynch, the Pies' drafting situation will have them hoping the Suns avoid matching a bid on their co-captain. With Crow Bryce Gibbs – three years older than Lynch – and Demon Jake Lever both commanding two first-round picks, Lynch would hold the same value and potentially more. As Stuart Dew conceded "it's not looking great" to retain Lynch, the Suns continue to weigh up the possibility of matching a bid or accepting compensation – most likely pick No.3. Outside of free agents including Alex Fasolo, the Pies have Darcy Moore and Jamie Elliott out of contract, who would deliver high-end picks should they wish to depart. Another loophole for Collingwood to deliver its required pick in 2018 would have them matching a draft bid on Next Generation Academy prospect Isaac Quaynor in the first round. As for Geelong, coach Chris Scott has spoken openly this season of the Cats' wish to remain active in the off-season. Any free agency acquisition would come free of charge, with the club keen to find a No.1 ruckman which could involve the pursuit of free agents Scott Lycett and Jordan Roughead.